November 27, 2013 November 28, 2013 by Beau H.
Before you dive into that turkey on Thanksgiving, step back a moment. Take the time to appreciate being with family and friends, and getting a little time off. And just as importantly, take the time to put a bit of effort into your appearance. Being around family members on a holiday should be some of the best times of the year, and it’s great to be able to reflect that enjoyment through what you wear — it should be appropriate and classy, because dressing up a bit is a nice nod to your family, too. So, with the stage set for a great holiday, there are some important things to consider when on the go to turkey day celebrations. Namely, if you live in a climate where winter’s on the way, consider layering up. And more importantly, don’t overthink what to wear. Stick to a personal uniform, perhaps with some regionally appropriate touches thrown in — for example, being in Florida is markedly different than in Michigan. With that in mind, here’s a starter template that should work for just about everybody. On a classic holiday like Thanksgiving that typically doesn’t involve anything too black-tie official, it’s best to keep it casual. 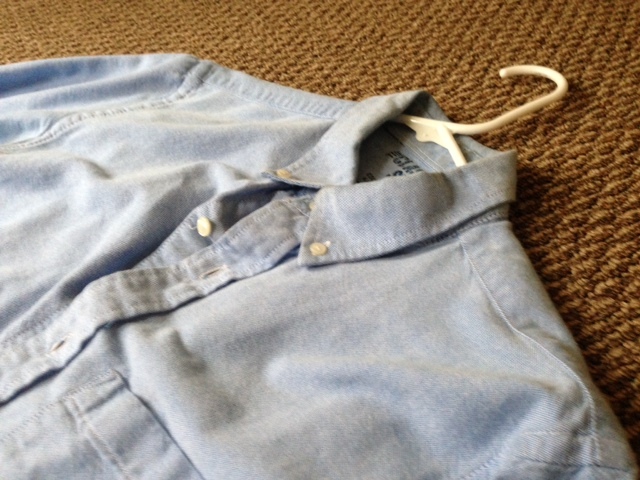 Here, something like a blue or white Oxford cloth button-down is a great asset. It’s the shirt equivalent of “dressed-up, but not “too-dressed up.” In a shade like white, it can provide a great neutral base for any pops of color on the rest of the outfit, and it shouldn’t be too hot or cold to wear in any location. Frank and Oak’s knit tie is woven with a thicker gauge and more bulk. While wool ties are fine for places where the temperature dips into the 20’s, 30’s or even 40’s, there are certainly more versatile pieces of neckwear out there — some of which you might already have in your closet. Since the days of James Bond, knit ties have been on our collective style radar. Sure, some might argue the knit tie is having a trending moment right now, but there’s a reason Sean Connery’s Bond wore classic black knit ties — a great knit tie will go with just about any outfit, and it’s appropriate for almost any climate, at any time of the year. For those on the heftier and more muscular side, a standard knit tie might be too slim — look for something in about the 2.75″ range (Frank & Oak’s knit ties feature a nice, thicker weave). In this particular instance, a dark knit tie won’t clash too markedly with any of the outfit’s other colors — which should preferably be more neutral anyway. If putting on a jacket crosses the formality line at your family Thanksgiving, consider swapping that out for a v-neck or crew-neck sweater (and maybe ditch the tie too). However, throwing on a nice blazer should be an easy choice — a jacket tailored for someone’s body accentuates a man’s chest and shoulders, making almost any guy look instantly better. Here, texture and fabric matters. A heavier tweed blazer is a great pick for cold weather — the tweed’s thick weave provides warmth and doesn’t look out of place trekking through the snow. But for the rest of us, a simple navy blazer (potentially unstructured to stick with the generally casual vibe of Thanksgiving) can work wonders. It can even be thrown on over a crew-neck or v-neck sweater sans collared shirt if things turn that casual. Here too, it’s best to keep in mind the surrounding climate where you’re celebrating the holiday. Linen pants won’t exactly work in winter up north, and heavy wool trousers won’t do you much good in Florida, for example. That’s why sticking with a slim chino in a medium-weight fabric is a sure bet. If you’re in a colder clime, corduroys would work just as well as a substitute. Once again, stick with a nice neutral color (maybe in a richer hue for the fall?). Keeping the proportions slim will hopefully pair well with a tailored shirt. Frank and Oak’s Newport Chinos in Amber. Wool tie not recommended for warmer climes — see above. With the rest of the outfit leaning towards polished-casual on the style spectrum, it’s best to keep the shoes in similar territory, too. Black shoes can seem too severe in all but the sharpest of combinations, and it’s likely there could be a sea of black shoes at the table come Thanksgiving. A rich, warm brown falls in line with the colors of the season, and should be much more versatile for other outfits later on. Reaching for a captoe/captoe-brogue combination or even a wingtip also pushes the shoe into the same polished-casual territory as the rest of the outfit. In colder climes, wingtip boots are a stellar option that can stand up to the elements — and the ‘eye test’ of your fellow diners. Of course, a true casual staple like desert boots is never objectionable when the situation calls for classic and polished footwear. Round out the ensemble by sticking to some clear fundamentals. Keeping your watch simple and unadorned (like this Timex Easy Reader) is the best way to go here — just be sure the watch, belt and shoes fall within the same color range in terms of leather. As always, colorful socks are today’s statement piece, an easy way to add personal flair to an outfit that mainly sticks to classic items. With these essentials in mind, and with some crucial personal touches thrown in, you should be ready to conquer Thanksgiving in style. Until the tryptophan puts you to sleep, of course. 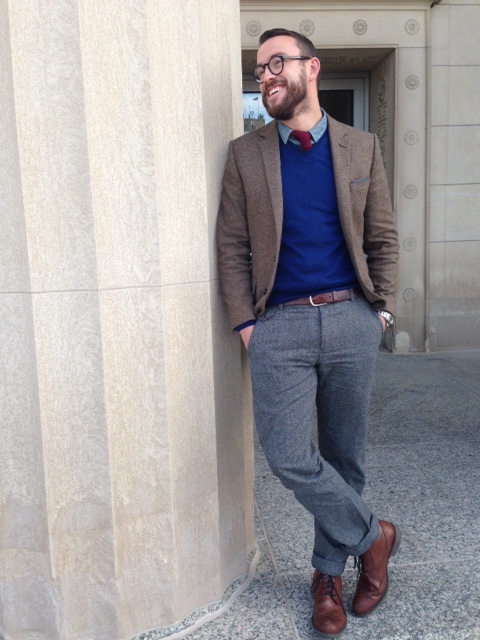 November 22, 2013 November 22, 2013 by Beau H.
One of the great things about menswear is that so many outfits start with simple, classic pieces. These are likely already items you might have hanging around your own closet, and if not, there are definitely affordable ways to make it happen. Something that you would feasibly wear everyday is a good place to start in terms of classic looks, and in the dead of winter, a strong, substantial peacoat won’t leave you out in the cold. The right peacoat can pass any muster test, particularly when it comes to standing up against snow or rain (and if you’re in peacoat country, those are probably the two types of weather you’re apt to run into most). We’ve seen a trend of dressing up outerwear — and that outerwear actually functioning as a stylish upper layer — but if you’re looking for classic function over form, there’s hardly a better place to start looking than a U.S. navy peacoat. In fact, substantial evidence suggests that these coats are probably out there in droves at surplus stores and Goodwill-type places, making it a downright steal for a coat that’s thick, warm and highly durable. A classic. 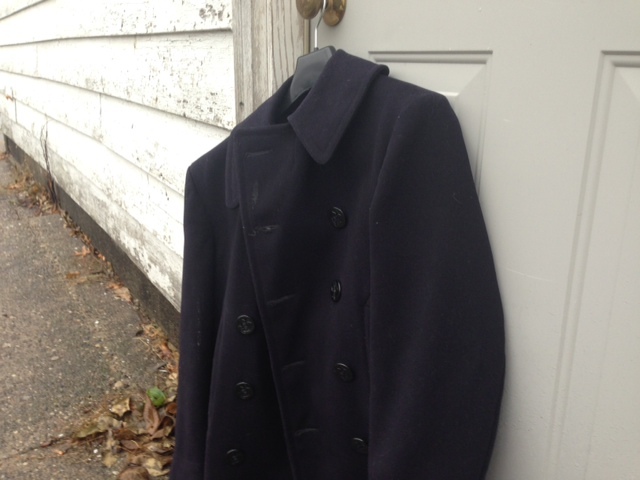 The U.S. Navy Peacoat — as authentic as it gets. The Siblings With Style Michigan hub was lucky enough to score a substantial upgrade from a beaten-to-shreds Express peacoat (something like this minus the colorblocking), to a coat that’s authentic and incredibly historical. Now, this item wasn’t tracked down at a surplus store, but this time around, it’s the real deal. Worn by my great-grandfather during his time serving in World War II, it has an unbelievable history of being passed down through multiple relatives, and it’s held up incredibly well for a jacket about seven decades old. 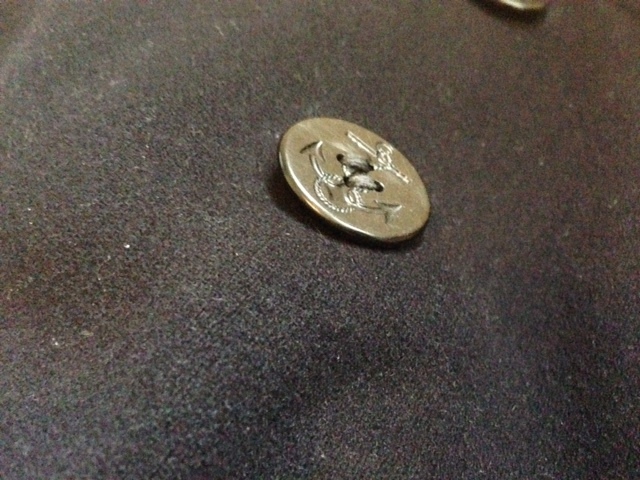 Interesting details on the jacket’s front buttons. That certainly means it’s somewhat delicate, and will probably be mixed in with other outerwear options as opposed to extreme degrees of everyday wear. However, the fit is spot-on. It actually fits trim but not tight, leaving room for layering. The buttons are heavy and substantial, the collar is thick enough to stand up to Michigan winters, and the coat has kept its rich navy color, making it easy to pair with about anything. Certainly, it’s an item that has more historical value than a typical peacoat found at a surplus store, but it falls in the same ballpark quality and looks-wise. It’s a jacket that’ll do just fine in the Michigan winter and then some. And, although this one was a family-related upgrade, chances are fantastic that a similar option is out there at a surplus store (or thrift shop?) near you. Happy hunting. November 15, 2013 November 15, 2013 by Beau H.
A huge component of fashion and style is phasing seasonal pieces in and out of one’s wardrobe. What worked for you in the summer (a polo and chinos, perhaps) probably won’t work in colder temperatures, and the same can be said for cold-weather garb. We’ve been working our way toward winter in Michigan for a good while now (remember those wingtip boots? Now’s the perfect time to break them out), and with the first truly cold blast of cold weather comes another reminder about seasonally appropriate style. 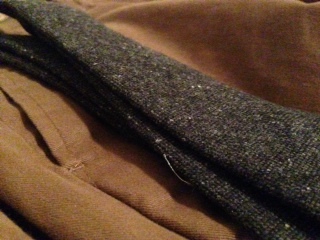 The great thing about so many fabrics that work in the fall is that … well, they work in the winter, too. 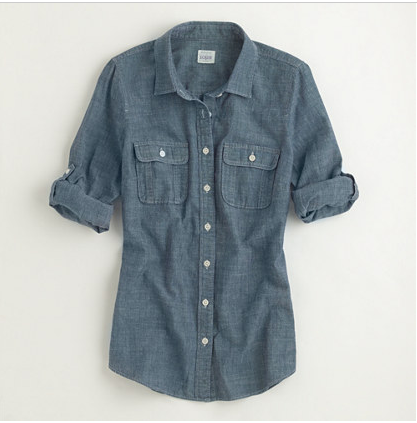 J. Crew’s chambray shirt. Nice texture for winter, without a doubt. One way to transition your wardrobe in small steps from fall to winter revolves around emphasizing chunkier, thicker textures and fabrics, namely in suiting, shirting and neckwear. Of course, layering is important, as well. A heavier fabric that can get great play in both fall and winter is denim — not just on your legs, though. Denim and chambray shirts can break up a typical shirt-and-sweater combo through a thicker weave and rougher texture. Even in the dead of winter, a light chambray shirt is still appropriate — the fabric is like a classic OCBD, but with slubbier texture. Both types of shirts pair well with knit ties or heavier pieces of neckwear, and variations on styling a chambray shirt with dark denim are often used to great effect across the #menswear world. An added benefit of working in rougher textures like chambray and denim is that shirts and other seasonal staples often come in neutral colors, so pairing them together is quite easy. If you do have the opportunity to dress up on occasion, leave the ultra-shiny silk ties at home at least once or twice. The same fabrics in vogue in suiting for the winter are just as accessible in terms of neckwear — look no further than last month’s Frank and Oak Hunt Club crate for a great example of a heavier wool tie. What’s more, switching to a heavier tie fabric ultimately makes sense with other textural changes — a wool tie and chambray shirt is a nearly foolproof combination because of the way those two items play off each other. Knit ties, while versatile and usable at any time during the year, are even more appropriate during fall and winter. 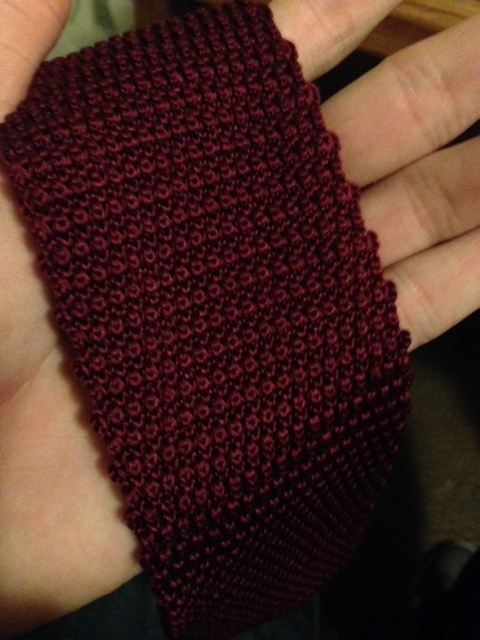 Again, a knit tie swaps out the sheen of a typical silk tie for something more visually interesting — a thick weave. Because a knit is inherently more casual (square end, more texture, less shine), it can be paired with dark denim and a great pair of shoes quite easily. And if you find yourself in a business casual office this fall or winter, try out a combination like that on a ‘Casual Friday’ — it’s probably instantly more polished than other get-ups out there. An example of how to tie it all together — chambray shirt, knit tie & herringbone blazer. Don’t forget those boots! The key to completing an entire outfit (particularly in a business casual situation) is often a good blazer. A blazer can clean up lines in an outfit, emphasizing a man’s torso and shoulders; in the right size (and maybe with some tailoring), nearly anyone looks good. Now for the winter, a good cotton blazer can probably pull just as much duty as in the summer or spring. But leave the linen blazer in the closet for now, and if you do want to switch out fabrics, reach for … you guessed it — something with a thicker weave, like this herringbone number from J. Crew. H&M also features a much cheaper option in a winter-appropriate fabric, but the tail could be a bit chopped (too short for the taller fellas). When the cold weather strikes, transition your wardrobe as you would from any other season, rotating out pieces you don’t wear for pieces you will wear. Keep in mind that heavier textures add visual interest and depth to an outfit, and use neutral combinations like chambray and wool ties to pull together seasonally appropriate (and versatile) looks. November 5, 2013 by Beau H.
When temperatures plummet (as they continue to do in Michigan), there are few things more dependable or reliable than a great pair of boots — be it a brown wingtip pair, or a more substantial black leather pair. No company fits the bill better in recent years for making boots of exceptional quality than Wolverine. Once known for work boots found all across construction sites, the company’s 1000 Mile line is nothing but class. Substantial construction, high-quality leather and rich colors all bump these up a notch from a typical pair of boots. 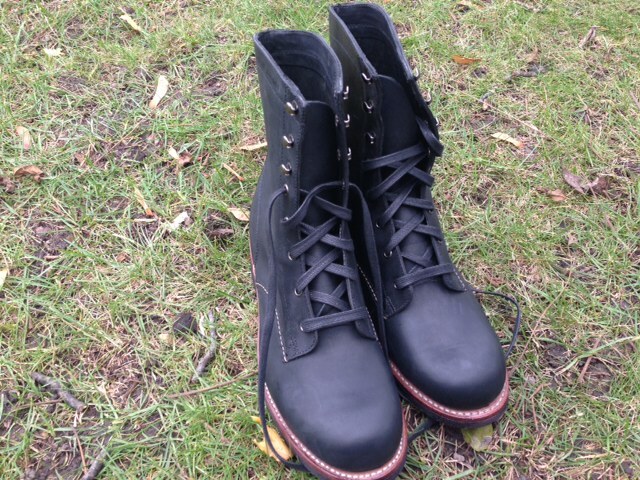 Wolverine 1000 Mile Austen boots in black. The perfect shade and style for fall and winter. The best part? These are the rare shoe that are durable and rugged enough to actually wear in other places besides the city — but rest assured, they won’t look out of place hopping around town. Their versatility has transformed them into a favorite of urban lumberjacks and other well-dressed guys everywhere. A recent order shipped into the Siblings With Style Michigan offices only validates Wolverine’s historic legacy of excellence. 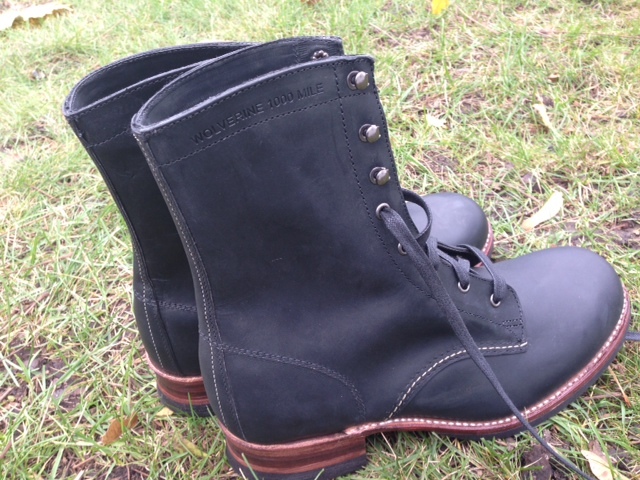 The 1000 Mile Austen boots in black leather (as picked up from JackThreads) are an absurdly beautiful pair of shoes out of the box, even to the non-shoe expert. The pair’s welted sole is stitched, not glued on (always a sign of a great pair of boots or dress shoes). The Horween leather feels tough, but should break in tremendously over time. The real kicker of this pair is the sole — not only is it stitched, but it’s also perhaps the sturdiest sole I’ve seen on a pair of shoes. The construction (particularly the sole) is rugged and functional. At first glance (and without any wear as of yet), these shoes look phenomenal. They’re sturdy and durable enough to last for long walks across campus, yet they’ll do just fine sitting under a pair of dark denim. Through the rest of the fall and winter, I can see them being a great complement to cardigans and v-neck sweaters — and perhaps even a winter-weight blazer. Look for more to come as these boots get some serious wear. With construction and quality like these, it’s only a matter of time.